The “Green Theory” of aging proposes that organismal lifespan is limited by the failure to repair molecular damage generated by a broad range of metabolic processes. Two specific predictions arise from this: (1) that these processes will produce a wide variety of stable but dysfunctional compounds that increase in concentration with age, and (2) that organisms maintained under conditions that extend lifespan will display a reduced rate of accumulation of such “molecular rubbish”. To test these predictions, novel analytical techniques were developed to investigate the accumulation of damaged compounds in Drosophila melanogaster. Simple preparative techniques were developed to produce digests of whole D. melanogaster for use in three-dimensional (3D) fluorimetry and 1H NMR spectrometry. Cohorts of Drosophila maintained under normal conditions showed an age-related increase in signals consistent with damage whereas those maintained under conditions of low temperature and dietary restriction did not. 1H NMR revealed distinct age-associated spectral changes that will facilitate the identification of novel compounds that both increase and decrease during aging in this species. These findings are consistent with the predictions of the “Green Theory”. 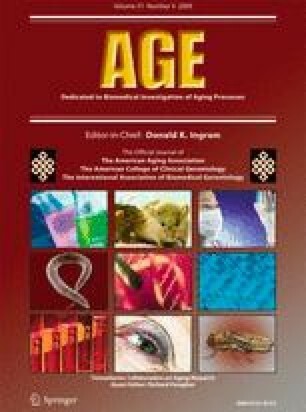 The authors would like to acknowledge the financial support of the Engineering and Physical Sciences Council (EPSRC) and Biological and Biotechnological Sciences Research Council (BBSRC) Strategic Promotion of Aging Research Capacity (SPARC) Programme, the Wellcome Trust and the University of Brighton.